Born in Lampung, South Sumatera, Indonesia in 12th September 1977. 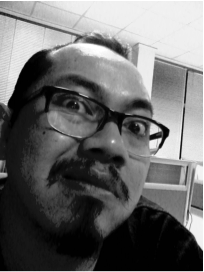 After the high school in 1996, I decided to move from Lampung to grab my dream and have a career in Art and Design in Institut Teknologi Bandung (ITB) from 1996-2001 and 2003-2005, specialized in Graphic Art/Print Making and Fine Art. Under the the famous artist, curator and lecturer in fine art ITB such as; Setiawan Sabana, Rikrik Kusmara, Tisna Sanjaya and Asmudjo Jono Irianto, Hendrawan Riyanto (RIP), Prof. Bambang Sugiharto, and I began my career as a IT Consultant, Art and Design Lecturer and fine art artist, until now. His track record, holding almost 20 art exhibition since 1998 until now.